It’s time to replace your shower but where do you start with so many options. From type, style, and design there a lot of factors to consider when shopping for a new shower. Along with these aspects you also have to think about door type, shower type, and any other extra features. But, aside from all of these custom features, you can go the easy way of pre-built, pre-fabricated. Pre-fabricated. This is the best option when shopping on a tight budget. It’s self-contained and comes in a single piece. It’s a relatively low price that’s easy to install. The downside is the lack of options and style and sizing. Custom. Custom showers are substantially more in cost because it’s built to your specific specs. What this means is that you can add any feature that you desire. You can use any material, any size, and any fixtures that you wish. Custom showers are also perfect for oddball spaces in which a pre-fabricated shower would fit. You’ll most likely need to contact a professional as this could very well be a difficult do-it-yourself project depending on your scope. Types. There are several types of shower mixers to choose from as well. A shower mixer is a device that mixes the hot and cold water together and often controls the specific water pressure. Manual Mixer Shower—this is the traditional type of shower and is still in a majority of homes today. You move the valve controls to decide the specific temperature each time you shower. They are easy to use and easy to install. Thermostatic Mixer Shower—These shower mixers are great for homes with small children because you set your preferred temperature for each time the shower is turned on. Often including a digital control panel, these mixers can help prevent scalding. Electric Shower—These shower mixers don’t require a hot water supply, only access to a cold water supply. They have a built-in heating unit to heat the cold water. 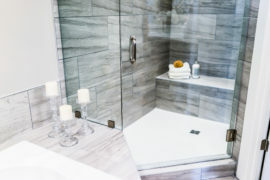 They are an excellent choice when adding a bathroom to a basement as they don’t need to be connected to the hot water supply. Shape and style. As with types, there are a variety of shapes and styles for your shower. Rectangular—This is generally the shape for a freestanding or walk-in shower. Because of the ability to choose the size, you can make these walk-in showers as spacious as you wish. Curved—A curved walk-in is a great option for a corner in a bathroom, especially one in a small space. Angled—a modern option is the multi-sided angled option with the door in the center of the shower. Another great option for a corner. 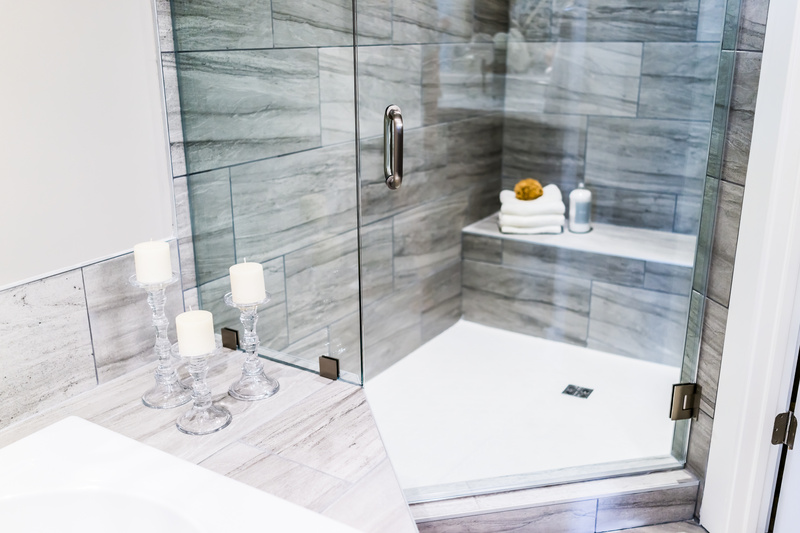 Tub-shower—instead of being a free-standing option, this one has a bathtub as the base and is designed to save space in a bathroom where a separate tub may not be an option and a tub is desired. Beyond all of these options, you then can choose the type of door that you want, from sliding to hinged to pivot doors based on your preference. Then, decide on the types of shower heads and fixtures that you desire based on your desire and preferences. Choosing a shower can be a little overwhelming. As always give us a call with any questions!